Kaira Rouda is a successful entrepreneur and now she can add successful "author" to her list of accomplishments. 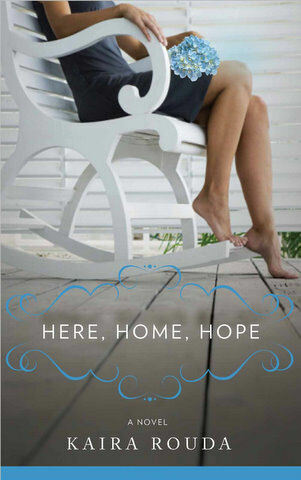 Her latest novel, Here, Home, Hope has been receiving numerous rave reviews. Reader Girls is participating in the blog tour for this adult contemporary/chick lit novel. 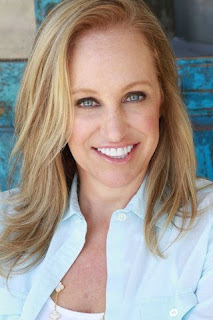 Summary: Kelly Mills Johnson becomes restless in her thirty-ninth year. An appetite for more forces her to take stock of her middling middle-American existence and her neighbors' seemingly perfect lives. Her marriage to a successful attorney has settled into a comfortable routine, and being the mother of two adorable sons has been rewarding. But Kelly's own passions lie wasted. She eyes with envy the lives of her two best friends, Kathryn and Charlotte, both beautiful, successful businesswomen who seem to have it all. Kelly takes charge of her life, devising a midlife makeover plan. My review: With the amount of fantasy and paranormal books I read in a year it is always good to take a breather and read something else for a change. My latest taking-a-break novel was Here, Home, Hope, an enjoyable story, and one best recommended for reading in a quiet place to better absorb all of the main character's musings. With the big "40" approaching, stay-at-home mom Kelly begins to wonder and question her life. Some would call this the 'mid-life crisis" but I have never really cared for that term. She faces a breast cancer scare, goes into therapy, has crying jags, and really begins to look at her own life and happiness when her two sons (a preteen and teen) are away at summer camp. Kelly creates a Things to Change list and places post-it notes all around. Part of her objective is to reconnect with old friends and she does so with Beth, a new mom. Besides this, she offers to help her friend Kathryn's teen anorexic daughter, Melanie (15), by taking her in while her mom goes away. Being good natured, Kelly also helps her real estate friend, Charlotte, by staging a divorcing neighbor's house for her. Kelly may be unhappy with some things in her life but she is married to a good man, Patrick, a partner in his law firm. While Kelly is able to get Melanie to open up, over time she does too, and this journey helps to give the novel heart. Ultimately, Here, Home, Hope is a novel about empowering women, showing us no matter who we are, we are the ones in charge of our lives and the directions in which we lead them. While I applaud the author's intentions, I did not always connect with Kelly. At times I thought there was too much telling and spent more time in Kelly's head than necessary. Other times I thought Kelly's comments were spot on, humorous, witty and honest. The pacing was slower than what I'm usually accustomed to, but as I grew to understand Kelly, I realized this novel was more of a contemplative story, offering a look at one woman's life, instead of being an action-packed page-turner. Kelly was an incerdibly insightful character and some of her lines were golden. Other times, like when she commented on her own obsession with weight (especially when dealing with an anorexic teen), and her habit of spending money freely (then trying to dispose of the shopping bags without Patrick finding them), seemed gratuitous. I was pleased to see Kelly had a wonderful husband, a man she viewed by the story's end as someone who truly loved and understood her for who she was. Here, Home, Hope unwinds like a new friendship, taking its time as the two of you connect, grow, and jump over the hurdles of relationships and of life in general. With humor and insight, Rouda paints a portrait of a woman on the cusp of growing older, contemplating her life before, while preparing for what lies ahead. Favorite excerpt: "Patrick and I walked out to the porch, but Melanie and Gavin weren't there. A glance into the yard revealed the two of them nestled in the hammock in the dark (and I had to admit, romantic) corner of the yard. We both stopped and stared. "Well, I could call Kathryn and find out what to do." "Sean said nobody says 'lame' anymore, remember?" Patrick chuckled, wrapped an arm around my shoulder, and started leading me over to the couch on the porch. "I guess we could sit out here and enjoy the evening. Draw a little inspiration from the teenagers." "Except then we'd be geeky voyeurs or losers or something. Besides, I just got a mosquito bite. How about we leave them out here tonight, and I'll get some boundaries established tomorrow?" I took Patrick's hand and led him inside. I glanced over my shoulder, and as far as I could tell, there was indeed what we called making out going on in that hammock. I don't know what it's called now, but it looked like fun." Cover comment: I like the picture even if it gives a first impression of being a summer read. I really like the blues in the scalloped edging and the flower on the woman's lap, the way she is seated, comfortably but yet ready to jump up if necessary.